IPL Photo-Rejuvenation – Intense Pulsed Light (IPL) can remove some of the most common skin woes, including brown spots, melasma, broken capillaries and sun spots. This minimally invasive skin procedure can also treat signs of aging such as wrinkles or age spots and treat uneven pigmentation & Dyschromia. Light-based Laser Photorejuevation with the new State-of-the-art Palomar Icon is a non-surgical skin revitalization treatment that will improve your skin’s appearance quickly and easily. This advanced technology clears undesirable pigmentation issues such as brown spots, sun damage and vessels, revealing clearer, more beautiful skin. IPL Photofacial specifically targets age and sun related spots and corrects hyperpigmentation and malasma issues all while it is also stimulating new collagen growth reducing fine lines ands wrinkles. IPL photorejuvenation is very effective at improving the appearance of sun damaged, aged skin as it can remove brown spots and redness, age spots and small facial veins resulting in blemish free and youthful-looking skin. IPL Photofacial treatments also consistently and predictably improve texture, tone and color of the skin. IPL has also been shown to stimulate the growth of new collagen as well as decrease pore size, giving skin a more youthful appearance. Other areas on the body with spots and sun damage, such as the chest (decollete), hands, arms, back, and legs can be treated with IPL Photofacial. Individual results will vary and may not exactly match Before & Afters. IPL improves the appearance of sun-damaged and aged skin and can help eliminate unsightly dark spots and redness, resulting in more youthful-looking skin. IPL Photofacial treatments consistently and predictably improve the texture, tone and color of the skin with little to no down time. IPL also stimulates the growth of collagen to help reduce fine lines and wrinkles, decreases pore size and gives skin a youthful appearance. Any area on the body, such as the chest, hands, arms, back, and legs can be treated with IPL Photofacial. By targeting sun damage, brown spots and fine lines, this technology provides you with clear results and beautiful looking skin. To schedule a free consultation for IPL treatment in Palm Beach Gardens, please contact us today. What if an downtime is there with IPL? There is minimal downtime with IPL. To avoid complications and obtain the best possible outcome, it is recommended that you stay out of the sun for a week or two and avoid direct sun exposure for 48 hours before your treatment. Treatments should never be done over recently tanned skin. Staying out of the sun during the 2 weeks following treatment when spots are flaking off and new skin is exposed is also important. With sun protection results can last for years. * Skin is genetically programmed to pigment in response to UV radiation exposure. 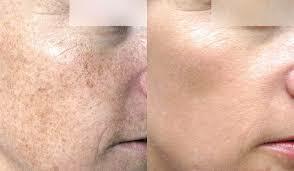 It is impossible to avoid all sun exposure but the more avoidance the less pigment. 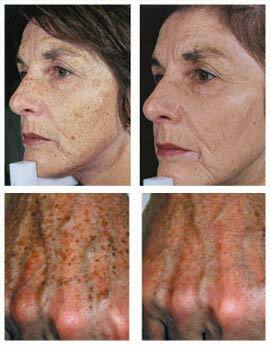 Even with the best of skin care and protection, new brown spots may emerge gradually over time. It is recommended that a skin care regimen be followed. To protect your skin, you should use sun screen and also utilize skin care products designed to suppress new development spots and discoloration. How does the IPL work?